Gotcha! I caught Ryza in the act here as she's trying to hide from her father. Her father was following her every turns she goes and was telling her to stop in one place. On the next picture she thought she finally escaped from him but I saw his father hiding from her on the side of the car. Funny father and child! She's one and only anyway! 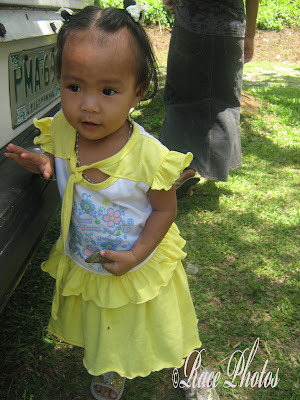 Ryza is my godchild, she's a granddaughter of our Pastor in the church. 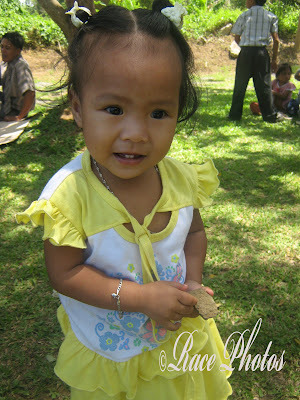 She's just one year old here last summer camp meeting! Visit more beautiful yellow themed pics, just click on the badge! Lovely yellow dress on a real cutie!